Cedaroak Home Finance capitalizes on West Linn connections. Stop in and meet Katie Walsh and Whitney Hogue today. You never know where friendships will lead. Katie Walsh and Whitney Hogue met as first-graders at Cedaroak Primary School in West Linn. They were best friends throughout their school years, graduated from West Linn High School, then went their separate ways for post-high school education and experiences. 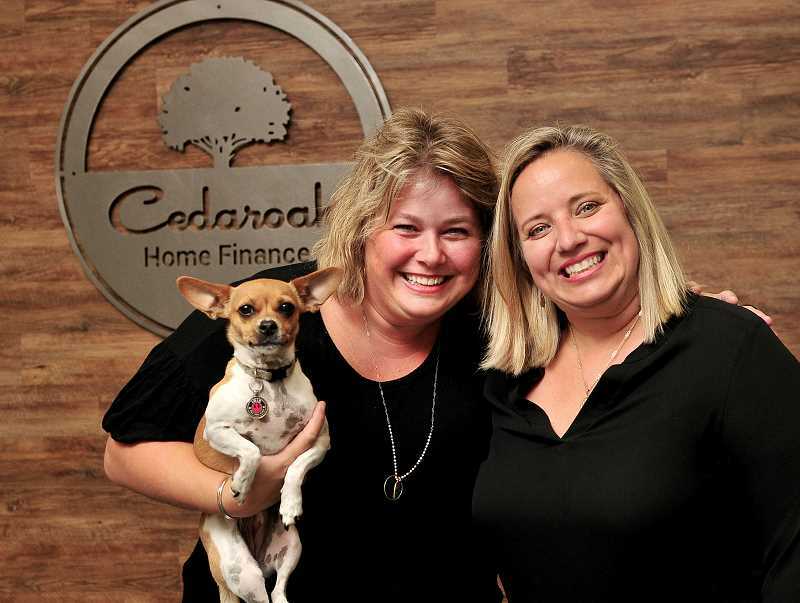 The women reconnected about four years ago and have founded Cedaroak Home Finance. Walsh had just moved back from Colorado where she had been working with The Mortgage Company, Cedaroak's parent company. Hogue had also been working in the mortgage industry since 1999; they saw an opportunity to collaborate on a business that would take advantage of their talents, skills and their connection to West Linn. "The name was easy," said Hogue. "Cedaroak is where we met in Mrs. Wilson's class." The women wanted to capitalize on the school connection for their brand and launched the business in April 2017. While working in Colorado, Walsh was impressed with the The Mortgage Company's reputation for being fast and efficient in loan processing. "We opened the first office of The Mortgage Company in Oregon," she said. She serves as Cedaroak Home Finance's mortgage lender and makes it her primary goal to get clients pre-approved before "Getting into the car with their realtor." "I want to educate buyers on their options," she said. "Meeting with people is a lost art. I like to sit down with them and go through their numbers. This is the biggest purchase of your life." Hogue is the relationship manager of the firm and sees each client and agent as an opportunity to engage and listen. She says her "no-nonsense yet fun-loving style puts people at ease" and the women's ability to navigate the often-confusing home loan process gives clients confidence in the transaction's outcome. Walsh, who was proudly proclaimed the class clown of her graduating class, lives by the motto "Work hard, play hard, laugh daily." "We bring a sense of humor to our business," she said. Hogue agrees that life is too short to take seriously, but says that inside and outside the office their clients' transactions are their number one priority. "We focus on being ourselves, authentic and genuine," Hogue said. Her advice to clients is to "Make your payments on time and go with your gut, smile and have FUN!" Cedaroak Home Finance offers residential loans and refinances. The office is located at 21780 Willamette Drive in West Linn. The office number is 503-908-5626. Learn more online at cedaroakfinance.com.